Madison is instantly drawn to the handsome and intriguing Isaac Addington. She quickly realizes he’s a guy harboring a secret, but she’s willing to risk the unknown to be with him. Her world really spins out of control, however, when her best friend becomes delusional, seeing things that aren’t there and desperately trying to escape their evil. When the doctors can’t find the answers, Madison seeks her own. Add Embrace to your Goodreads TBR or buy it in paperback from Amazon, Barnes&Noble, and Omnific Publishing, and in ebook from Amazon and Omnific Publishing. In Cherie’s book, her protagonist struggles with embracing change. In a year that’s been nothing but change in the publishing industry, it seems like a fitting topic to close the year. Over the course of the year, I’ve seen writer friends switch from pursuing traditional publication to self-publishing their first (or second or third) novels (yay Indelibles!). I’ve known writers that stopped querying agents and submitted to small publishers (Cherie is one, releasing Embrace through Omnific Publishing). Other writer-friends have stuck with traditional publishing and landed agents and book contracts in 2011 (yay Terry Lynn Johnson, Adam Heine, and Joshua McCune!). Still others are fence straddlers (that’s me!) pursuing multiple paths at once. For writers taking the road less traveled along the self-pub route, it can be frightening to deviate from the “established” path, especially if the dream of a big advance from a large publisher has been a long cherished one. The bold will go forth into self-publishing because it makes logical business sense, but for the less confident, it can feel like quitting without trying hard enough. One thing that encouraged me to take the leap was the resounding chorus coming from the other side of the publishing point. There were many, many self-publishers that were extremely happy with their choice, whose main regret was that they waited so long to take the leap. As someone who is on the “other side” now, I can heartily say the same thing. Do I regret self-publishing? Not a bit. Every day, I’m happier I chose to leap when I did: people are reading (and enjoying!) my work, I’m building a fan base that extends beyond my awesome writer friends, and I have a measure of control over my writing career that eluded me before. This was the right choice for the Mindjack Trilogy and my career at this point. At the same time, I don’t regret going through a small publisher for my first novel, and I’m still pursuing traditional/big publishing for my middle grade series (because those are the right choices for those books). For many writers, the small publisher route wasn’t the “dream” they had as a child, but is the reality they are increasingly choosing as an adult. For a long time, I had to stop the small voice (evil, as Adam Heine calls it) inside that told me this wasn’t a “real” publisher because it hadn’t been around for 100 years. This evil voice completely baffled my husband, who said, “They’re willing to bet money that you’ll make money for them with your writing.” Ah, yes. This is a business, not a fairy tale! Strange, how often those are confused with one another. But this helped me put it in perspective and embrace my small publisher as an innovator in a tradition-bound field. Once I realized that, I found the small publisher route actually fit my personality quite well. While some writers with small publishers are increasingly opting for the self-publishing route (myself, Talli Roland), my friends who have chosen small publishers continue to find that to be the right path for them. I think small publishers are wonderful about embracing the desire to launch writers in their careers, which is part of what makes them a great place to start. I haven’t landed an agent or big publisher book contract (yet), but I have queried (extensively) and had some significant first-hand experience with agents and editors, as well as lots of second-hand experience through traditionally-published friends. Just because a writer chooses to pursue traditional publishing doesn’t mean they escape the need to embrace change. Lately, with the rise of self-publishing, writers choosing to stay the course with traditional publishing have been on the defensive, feeling like they have to justify their choice. This is something that self-publishers and small-publishers have had to do all along, so it’s an interesting turn in such a short period of time (less than 6 months ago, I wasn’t seeing any of this). Self-publishing affects trad-pubbed authors as well – the industry is roiling, agents are fighting for their livelihood, editors under even more pressure to prove the “viability” of a writer before taking a chance on them. The stakes and expectations are higher for debut traditional novelists, and even those with novels already out. Elana Johnson spoke eloquently about how even after traditional publishing (or maybe especially then) that her definition of “success” all comes back to the writing. To me, this is key: the thing that rules, that has to rule, at all times along the journey is the writing. It is the creation of content that is most important, with the path to publication simply a means to an end. To me, embracing change means embracing the writer. No matter what path we follow, we writers are much more similar than we are different. Writers pitted against each other, judging each other for the path they choose or the level of “success” they achieve – who does that serve? Not writers, of that much I am certain. Writers are an amazingly supportive bunch … when they’re not judging another writer. We are our better selves when we’re banding together to support and help promote one another. This is why groups like the Elevensies (trad-pub), the Apocalypsies (small and large pub), and the Indelibles (self-pub, official launch coming soon) are so important. I’ve seen this grouping of writers for support happen at my small publisher as well. I think it’s a natural (and wonderful!) tendency for writers to band together and help each other out. These groups provide a safe haven of support and an avenue to celebrate each other’s successes. When it comes right down to it, we are all simply writers. Published or unpublished, traditional or indie, bestseller or midlister – at the beginning of every day we are moving forward with our writing. The journey (hopefully) is a life-long one filled with friends and a love for the craft. I wish everyone on the journey a joyful holiday season! I’ll be taking a break to eat Christmas cookies, wrap presents, and catch up on my TBR pile, but I’ll be back in the New Year with another Internet Book Fair. If you get a Kindle or Nook or iPad under your Christmas tree, be sure to stop back then to browse for some new, great reads! Cherie is giving away an eCopy of EMBRACE and 5-Embrace Hemp Bracelets today. Nothing could have prepared her for what she’s about to discover. stop of the tour for a chance to win the Grand Prize. Well said Susan! The book industry is changing fast and no matter what route a writer chooses, I hope they enjoy the journey. I know I am. After all, we write to share our work with other. Thanks for writing such an awesome post on embracing change! peace and goodwill towards the legion of authorial coolios! What a wonderful post, Susan! Thanks so much for the mention, too. You're so right – no matter what route we choose, we're more alike than different. I like change, especially when I have enough to afford a coffee. Happy to join in, especially with a book title and theme like this. Yay, to all your thoughts here, Sue! Love the post, too. I've gone the small-pub route, too, and totally have had many small (evil) doubts along the way. But I love my house! Susan, that's wonderful you have no regrets for self-publishing. Sounds like quite the opposite, actually! Way to go, small-pub-sister (I like the sound of that). I'm very excited for you, Cherie! Yeah, that's exactly what it comes down to – the writing itself. If its fabulous and grabs people, it doesn't matter how it made its way out in the world. P.S. I'm hoping to join the world of eReaders this Christmas…hear that, Santa? So I look forward to that book fair. @meradeth I hope we can kill off some of those small voices today! This is the second post on embracing change I've read in a row. So well said, Susan! And congrats to Cherie on her debut! And it's always good to know what is going on in the industry and what changes have happened. It makes it easier for those as yet unpublished to make the choice that is right for them! Excellent post about embracing changes in the industry and riding the wave into finding readers. I can't wait to embrace a copy of Embrace in my own two hands. 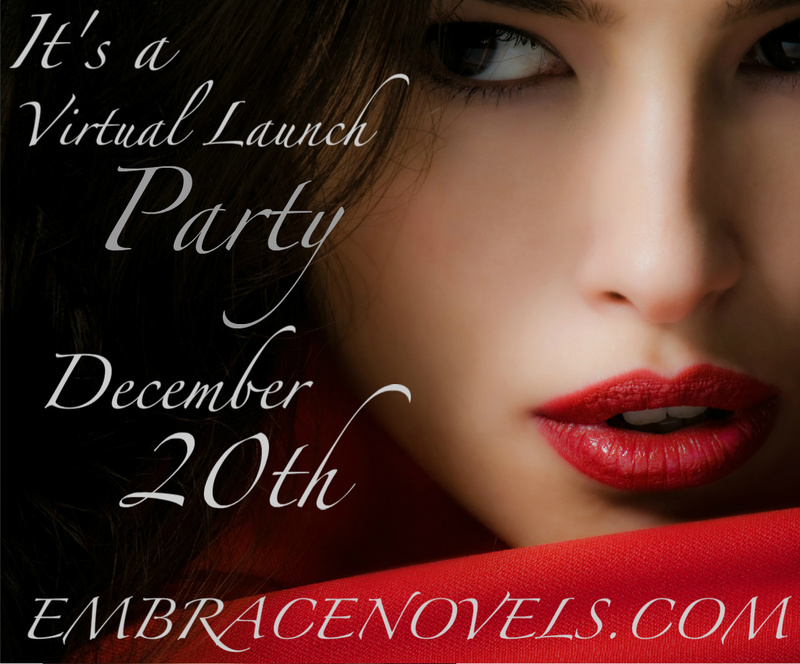 I'm so excited for Embrace, and for Cherie! I can hardly wait to get my copy. As my TBR list grows ever taller. As technology charges forward it's exciting to see how it opens more pathways to publishing.